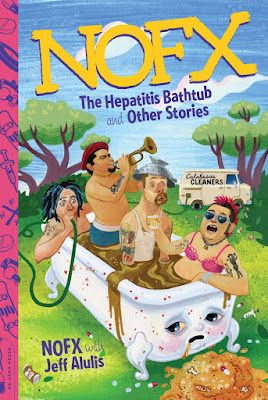 For the past few years I've been working as the ghostwriter for NOFX's official autobiography, The Hepatitis Bathtub and Other Stories, and it's finally available for pre-order on Amazon and BarnesAndNoble.com! NOFX will be doing a special reading from the book and a Q&A at this year's SXSW Music Festival, followed by a U.S. tour in support of the book. I can say with certainty I've never read a rock biography with such balanced elements of sensation and sincerity. Like the few great band bios, the array of experiences described in The Hepatitis Bathtub are enough to set anyone into contemplation about strength and perseverance, love and depravity, camaraderie, and a place for misfit rock and rollers in a society that to this day clings to rigid standards. A must-read for punks new and old and an eye-opening read for all new-comers."